Strengthening your abdominal muscles is an important part of maintaining your spine's stability and improving your posture. However, it's not always possible to work out on the floor. 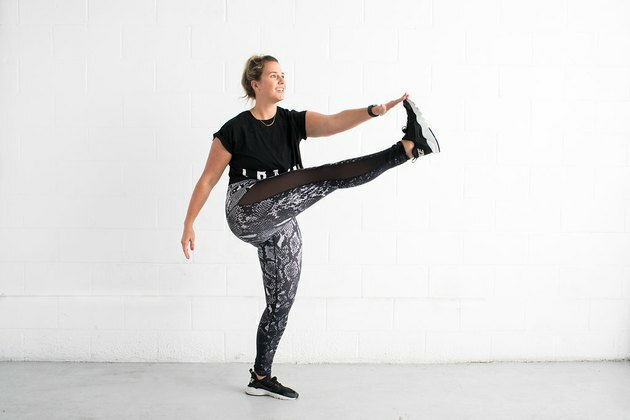 Whether that's due to impaired mobility or simply because of the nature of your workout environment at work or home, there are plenty of effective and challenging ab-strengthening exercises you can do while standing. Here are five of the best (as shown by wellness blogger @FittyBritttty). HOW TO DO IT: Start standing with a medicine ball held at your waist. Squat down as your move the ball down toward one of your feet. As you squat, your knees should stay directly over your feet and should not buckle inward. In addition, your knees shouldn't move forward beyond the end of your toes. 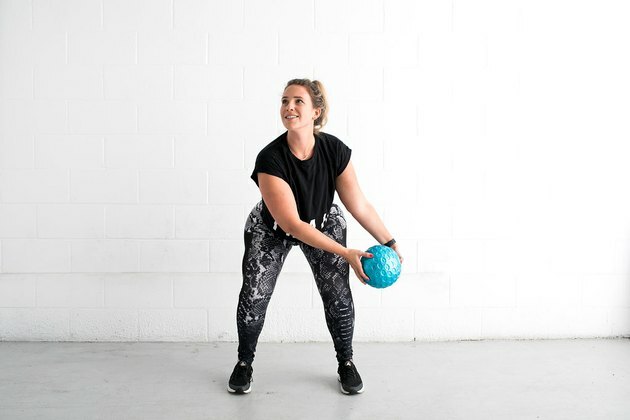 Straighten back up to a standing position as you lift the medicine ball along a diagonal until it's raised over the opposite shoulder. After full a set of 10 reps, repeat on the other side. Complete two to three sets in each direction. HOW TO DO IT: Stand tall with your arms hanging at your side and a weight in each hand. Slowly bend to the side and slide the weight down the side of your leg until it reaches your knee. Don't rotate or twist your trunk. Your shoulders should remain facing forward as you perform this exercise. Hold this position for one to two seconds, and then slowly return to standing. After two to three sets of 10 repetitions, repeat on the opposite side. HOW TO DO IT: Stand with your hands interlaced behind your head and your elbows out to the side. Lift one knee up as you simultaneously move the opposite elbow toward it. Attempt to touch the two together, if able. This will cause your trunk to flex and rotate. Hold the position for one to two seconds, and then slowly return to the starting position. After doing a set of 10 repetitions, repeat with the opposite leg and elbow. Do two to three sets each time you perform this exercise. 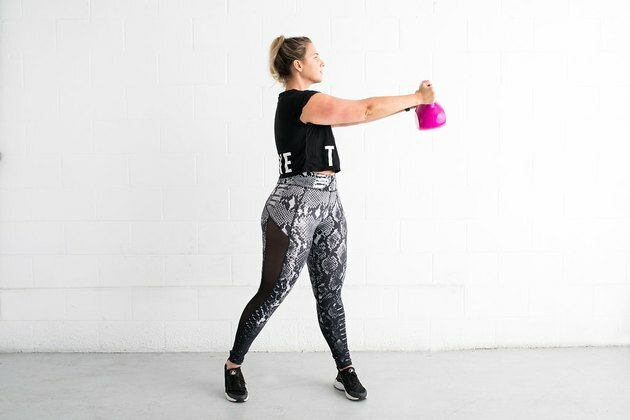 HOW TO DO IT: Hold a kettlebell, dumbbell or weight plate with both hands at shoulder level straight out in front of you. 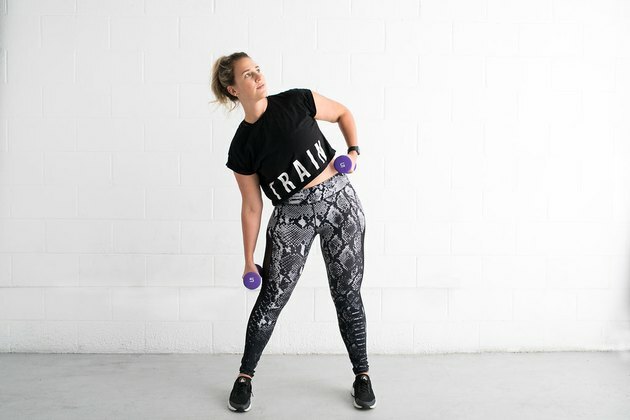 Slowly rotate your trunk and shoulders to the right side. Your feet should remain planted and your elbows should remain straight. Visualize a tray of food on your arms and try to keep the food from falling off the tray as you turn. Once you've turned 90 degrees, hold this position for one to two seconds, and then slowly return to the starting position. Repeat to the opposite direction. Complete two to three sets of 10 reps to each side. HOW TO DO IT: Stand tall with your abdominal muscles engaged and your arms extended out in front of you. Slowly kick one leg forward as you try to touch your toe with the hand of the opposite arm. The knee should remain straight at all times. If possible, touch the hand and foot together and hold for one to two seconds. Then slowly return the arm and leg to their starting positions. Complete two to three sets of 10 repetitions, and then repeat with the opposite arm and leg. What are some of your favorite ab exercises? Are any of them standing ab exercises? Have you done any of the ones on this list? Do you think you'll give any of them a try? Share your suggestions and stories in the comments section below! And be sure to follow wellness blogger (and our model) Britney Vest on Instagram at @FittyBritttty!